FOXBOROUGH - Junior Seau just can't say no to a Patriots team in need. The 39-year-old inside linebacker is prepared to once again abandon sunny Southern California and the comfort of semi-retirement to bail out New England coach Bill Belichick and an undermanned Patriots linebacking corps. After getting a call from Belichick and vice president of player personnel Scott Pioli Wednesday night, Seau was here yesterday meeting with the team and on the verge of returning for a third season with the Patriots and a 19th in the NFL. Seau's agent, Marvin Demoff, said early last night that Seau, whose flight landed at 3:45 p.m., could be signed by today, barring complications. The Patriots would have to clear a spot on their 53-man roster to make room for Seau. "If Junior is there and nothing is different from what they thought [Wednesday] night, I would suspect they'd do a contract, and he'd be a Patriot [today]," said Demoff. "But I don't think there were any promises made to Junior or by Junior to them before he got on the plane." Demoff said Seau sounded excited about the prospect of playing after he informed his agent about the Patriots' interest in bringing him back. "He asked me, 'What do you think?' " said Demoff. "I said, 'Be honest with yourself - do you want to play and have fun or do you want the attention?' He said, 'It would be fun. I'd be an old man trying to get a ring.' "
Seau had surgery to repair a torn left rotator cuff in February, shortly after the Patriots' 18-1 season ended with a loss to the Giants in Super Bowl XLII, but Demoff said the shoulder, which prevented Seau from being ready for training camp, is no longer an issue. "His shoulder has been fine since sometime in August," said Demoff. 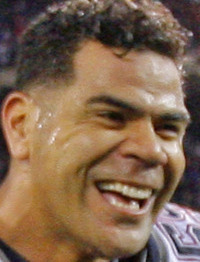 The Patriots stayed in touch with Seau following last season, when he was a defensive captain and finished fifth on the team in tackles with 76. Both sides left the door open to a return, but a slew of injuries to the Patriots' linebackers prompted the team to put out the welcome mat for Seau, a 12-time Pro Bowl selection. The Patriots are preparing to play the Seahawks Sunday in Seattle with Mike Vrabel, rookies Jerod Mayo and Gary Guyton, and Rosevelt Colvin, who was signed Wednesday, as their only healthy linebackers. Starting outside linebacker Adalius Thomas is out with a broken right forearm; his replacement, Pierre Woods, suffered a broken jaw last Sunday against the Steelers. Rookie outside linebacker Vince Redd hasn't practiced this week because of an ankle injury. Veteran inside linebacker Tedy Bruschi is dealing with a knee injury that has limited him in practice the last two weeks. "[Junior] received a call from the Patriots that the situation now would be good for them if he wanted to play the last month or so," said Demoff. "He got on a plane to talk to Bill and Scott in person. Junior played many years in San Diego and played in Miami, too, but he had a unique feeling about the Patriots. Whatever transpired in the conversation [Wednesday] between Junior and the Patriots, it got him on a plane to continue talking." In October, when the Patriots played the Chargers, Patriots owner Robert Kraft presented Seau with his 2007 AFC championship ring at the linebacker's restaurant in San Diego. Seau, who will turn 40 in January, hinted he would come back if the Patriots called. "With the guys in that locker room, and obviously the organization, there is such a great tie," he said. "I have a place in my heart for them forever. I wouldn't want to fight for anyone else but Kraft and Belichick." Demoff confirmed Seau wouldn't have considered a return with any other team. "If any of the other 31 teams had called, he would have appreciated the call and respectfully declined," said Demoff. This isn't the first time the Patriots have lured Seau back to the game. In 2006, after Seau had "graduated" from football, Belichick was able to convince him to continue his career in New England. Seau started 10 games that year before breaking his right forearm in the 11th game of the season. He famously waved goodbye as he was exiting the field, only to return for another season. This time Seau is waving hello to a third go-round in New England. "Everybody has a couple of people that sort of get through to him," said Demoff. "The people at the Patriots somehow communicate very well with Junior."